Economically, times are tough. Unfortunately, for a lot of individuals and families, it doesn’t take very long for debt to become overwhelming. The loss of a job, medical bills, student loans, a business failure, and many more factors can all lead to one being financially overcome. Just as there are many ways to get swallowed up by debt, there are many ways to climb out of debt. Understanding all of the options and which is the best can be intimidating. Two very common options are debt consolidation and bankruptcy. Here is a closer look at each. Debt consolidation involves working with a consolidation company that basically serves as a middleman between you and your creditors. This middleman often tries to reduce the money you owe and the interest rates. Then a loan is taken out to pay off these debts/loans, thus leaving you with just one monthly payment. There are several pros to going the route of debt consolidation. One such pro is that debt consolidation is not a matter of public record (unlike bankruptcy). In addition, according to Myrna Serrano with NOLO, “although a debt consolidation may show up on your credit report, it does not typically lower a credit score like a bankruptcy filing does.” Another factor that is appealing to many is that debt consolidation simplifies things. Instead of making many payments, you are only responsible for one monthly payment. However, debt consolidation has some negatives. For one, it doesn’t remove debt and you could end up loosing property. With debt consolidation, you’re still paying back a loan. If you use your home, vehicle, or other property as collateral for a debt consolidation loan and default you may loose that property. Furthermore, sometimes, debt consolidation may extend your repayment period. Do the math. You may end up paying more in the long run. Bankruptcy involves going before a court and petitioning to have debt eliminated or restructured. One advantage of filing for bankruptcy is protection from creditors. Myrna Serrano writes, “when you file for bankruptcy, you get the protection of the automatic stay. The automatic stay prohibits most creditors and collectors from engaging in collection activity against you.” This refers to those harassing phone calls and letters, as well as repossessions and foreclosures. Bankruptcy also provides a fresh start. In a lot of instances, you can remove debt. The disadvantages of bankruptcy include a negative impact on your credit rating for the next seven to ten years. However, it’s important to keep in mind that if you’re in financial trouble, you may already have a damaged credit score. In addition, bankruptcy is public knowledge. Your employer or landlord may find out about it. Another con to bankruptcy is that not all debts may be eligible for discharge. One debt that can be hard to get dismissed under bankruptcy is a student loan. 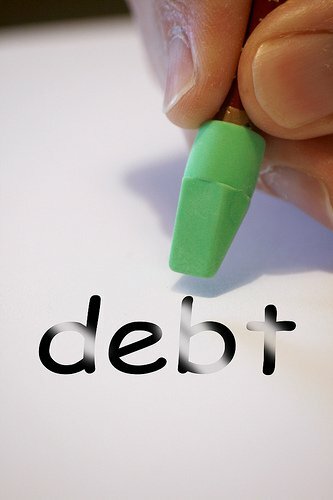 Carefully weigh the options available to you to remove debt. Seek the opinion of those you trust especially if they have been in the same boat as you. Don’t hesitate to get in touch with an experienced bankruptcy attorney who can evaluate your situation and make recommendations.